I have designed a new (more DIY friendly) PCB for Neumann W492. It is a good sounding equalizer that I selected to be part of my mixer project. I will publish all the documentation here when it is ready. If you have other sources of potentiometers and/or knobs, please let me know. I will add them here. I would be interested in 4 x PCB's for this, assuming you are going to manufacture PCB's. You mention the pots are hard to get, is there an alternative pots that are easy to get that you could design it with? How long do you think it will take to get to PCB stage? Great project, best of luck with this. I own a pair of the smaller W491's. If I"m not mistaken they are transformer coupled on the output or inputs, I assume these W491's are transformerless? Also I assume for the frequencies you are using rotary switches? I know on my W491's both the freq's and the Gain are both on stepped switches, in your design are they constantly variable, or are the freq's on switches and the gains on pots? It does indeed look like a very cool project and funds permitting and depending on costs I'd be in for a few boards. P.S "A post like this should probably be in the "Black Market" section of the forum"
I am going to order my boards from Olimex. That is why I have selected the size so that two boards fit side by side in their proto Euro card. It costs 30 euros so the price will be 15 euros for one board. I will prepare Gerber files for Olimex if someone else also likes to order from them. I will also prepare normal Gerber files (only one board) for ordering from other manufacturers. I am not going to start selling these PCBs. This is not a business to me. I am just sharing my design with you. If someone manufactures these PCBs and sells them to others, that is ok to me. The W492 is DC coupled (no blocking capacitors) so potentiometers must be conductive plastic. Normal carbon pots will start to scratch quite fast. As I told I will order Sfernice P11 for my own use. I can order some extra if someone else needs them too. Frequency selection is continuosly adjustable (potentiometer). All potentiometers are mounted on PCB. Only in/out switches are wired. Did you get the pictures alright? Btw, for us home etching nuts over here, is there any chance you could post a layout so that I can give that thing the scanner treatment? I could run a little comparison with the console when I get around to building it. This gets me thinking...how about something along the lines of a stereo version? Neumann never built any of those. I guess it should be simple enough with 2 board, stereo pots and some component matching if necessary. Yo - This is great. Your design looks very good. Posting your design as Gerbers is great. I understand completely if you don't want to go into the business of selling PCB's. But doing all this work and posting it for us is more than admirable. One note - Purchasing Sfernice P11 pots is very difficult. I have tried. They are not in stock hardly anywhere. You can place an order for some minimum quantity (like maybe 50 pieces) and then wait 3 months to receive them. They are Cadillac pots. But they are not easy to just get. I have seen one or two places which stock some of the singles. Whether or not they have the desired value is the question. And dual's or triples..... forget it. DW. Audiox, that´s a friggin´cool project. Thanks for sharing. In your place I would not post the gerbers in the public. There are so many lurkers around here waiting for a opportunity to make a fast buck. I´m pretty sure that it won´t take long from posting gerbers to the day when the first "german broadcast eq clone" is sold by a "professional" company with your work burried inside. This happened here before - several times. The day you realize this will be the day that it´s too late and maybe the day you get angry. I would definitely not give anybody the opportunity to profit this way from my work. I think it´s cool to post the pdfs for home etchers plus the component placement. If you want to share the gerbers send them to Gustav or some of the other boardmakers here and let them distribute the finished boards. Don´t send gerbers to anybody else. That way nobody will be able to simply edit your files a little and then have a finished piece of proaudio-gear. I think I will publish the Gerbers when I have finished them (despite all the warnings). I don't want money or glory from my designs. I am happy if someone builds them. If some other misuses them it his shame. Sfernice P11 is not so difficult to get. A friend of mine works in a company that stocks the type I have used in this design. He gave samples for the prototype. And there are several distributors for Sfernice too. I am going to make 10 channels first, so I need at least 80 potentiometers. I am going to order some extra, so please feel free to contact me if you need them. I was told that delivery time from Sfernice is only few weeks (in Europe). very interesting project. 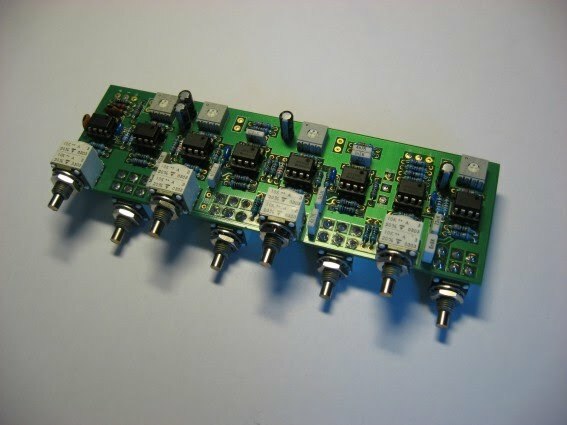 Top quality DIY EQ are quite rare here, so for my part, I would like to build this one. Keep us informed especially concerning pcbs and pots. You shouldn´t publish the gerbers here, as Jens mentioned, contact some of the pcb sellers here (e.g. Gustav), who would be glad to provide you and all others here with pcbs for a reasonable price. People like you and me and many others here would indeed not enjoy the money they might have made this way. Various others don't care at all about that though, money is money. I would hate to see something like that happen based on the info you provided. I'd suggest to reconsider your distribution-plans; before you know it we have for instance yet another PCBs available, but only with cases-deal in The Black Market. Add at least a clear disclaimer to the documentation and artwork: anyone who uses the provided files isn't allowed to do so for profit (both for PCBs as for 'derived' items). OK. I will wait with the Gerbers. I have contacted Gustav, maybe he is interested in manufacturing the boards. I´m sure most people here will appreciate when PCBs are availble, not only the files. Lets wait for Gustavs answer. I send him e-mail yesterday. After that I make a decision about publishing (or not) Gerbers and copper layer pdfs. I think that publishing pdf is practically same as publishing Gerbers. I can do pdf to Gerber conversion in 15 minutes, so I guess others can do it too. Have you noticed that the W495(ST)B uses 741 op-amps. So I wouldn't use it in original form in any demanding applications. The circuit is quite simple, so DIY version is not impossible but I would change the op-amps and the balanced output circuitry. However using the original switches makes it very very expensive. It is cheaper to buy a used one than to build a new. And by the way thanks for the pictures you send me some days ago.